I was in a contest to make a 1:64 scale replica of Tom Daniels' Groovy Grader and this is what I built. It is completely scratch built. The body was made out of one piece of resin. The motor is ALL aluminum and the ONLY part off of a diecast is the little hood ornament! I won the challenge with this piece. It is not for sale at this time. Another one of my favorites is the Impaler! This started out as a Hot Wheels Big Mutha casting. I scratch built one of my chassis for it and carved up the body. This was a tricky one to finish as I kept impaling myself on the sharp rear edges thus its barbed monicker. As always, a shot of the uncompleted innards! Here is another in my Fast Food Series. 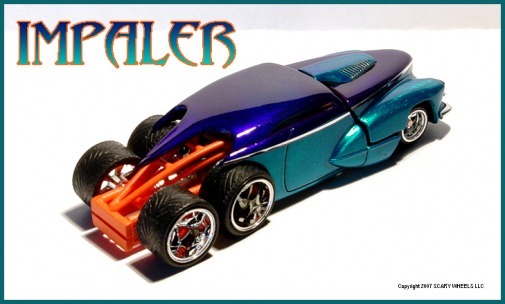 This was based off a Hot Wheels drag car but I forget its name. This baby will deliver your dog and set track records while doing so. 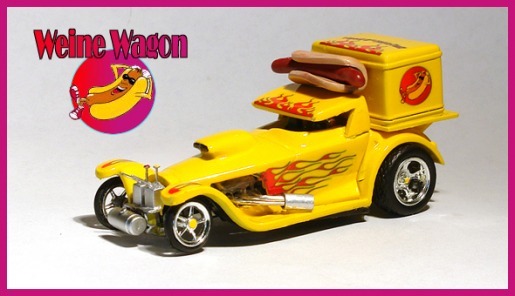 The Wagon is complete with mustard and catsup dispensers mounted on it nose (chili available upon request). 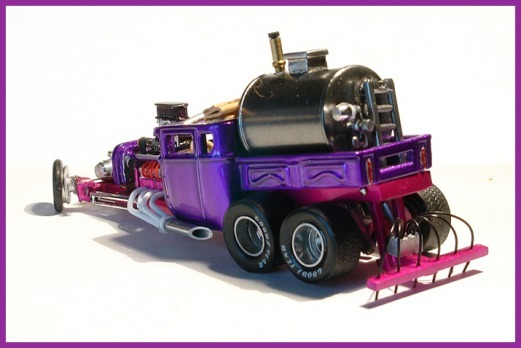 This was one of my early kustoms that I built for a Custom Truck contest. The Czar of Tar was my crazy twist on a blacktop truck. 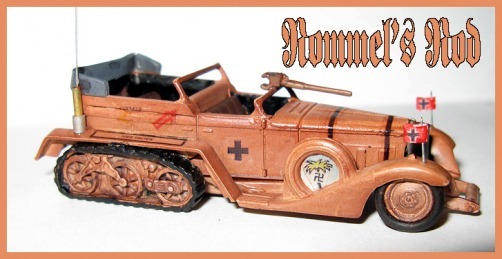 I used the Hot Wheels Boneshaker as my base car and the rest is pretty much scratch built. This one had steerable front wheels! Sweet rear end with tarring details. Here was my entry in my favorite contest of the year. 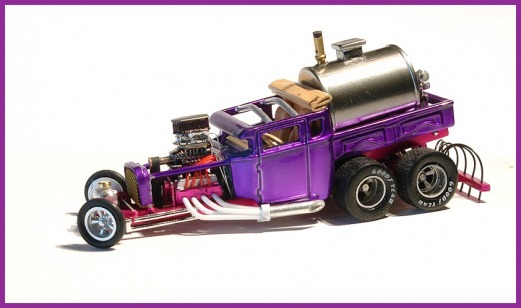 The 3rd Annual Rat Rod Contest over at Chilli'sdiecastcorner.com. I took 1st place for the 3rd year in a row with this build. This one features an alum. scratch built chassis, and alum scratch built inline 4 cylinder, machined alum front wheels, and a scratch built Coka Cola cooler in the back with ICE & BOTTLES! Plus a cool little skull dude with a Coke delivery hat. Cruise the Badlands in style. This little bugger is complete with a hand shaped wood frame and blower. "Go West Fast Young Man" comes to mind. Leave th chicken on the roof alone. It's for eggs! This was one of my favorite kits from the 70's. I always wanted to build a 1/64 version but never could find the right source casting. 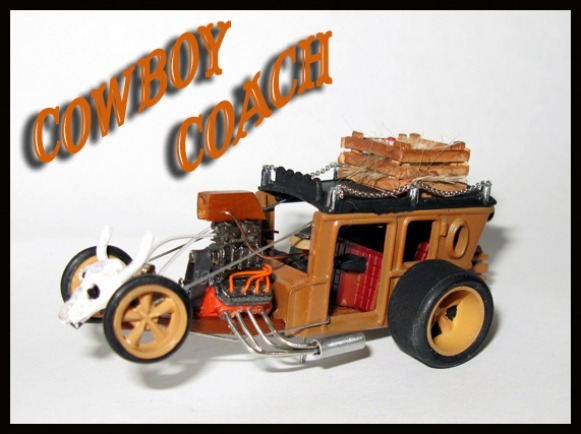 I got tired of waiting one day after I was sitting and staring at a Hot Wheels Packard casting. Dozens of cuts later and after a buttload of work this one emerged.